Applications close Friday 16 October 2015. How do you redevelop a public library in the digital age? The Tasmania ALIA Students and New Graduates group met with Garry Conroy-Cooper, manager of the Launceston Learning and Information Network Centre (LINC) on 24 June 2015 to discover some answers to this question. Garry took us on a tour of the old library building in Launceston’s civic square, soon to be reopened with innovative features that reflect a commitment to community, information and public spaces. 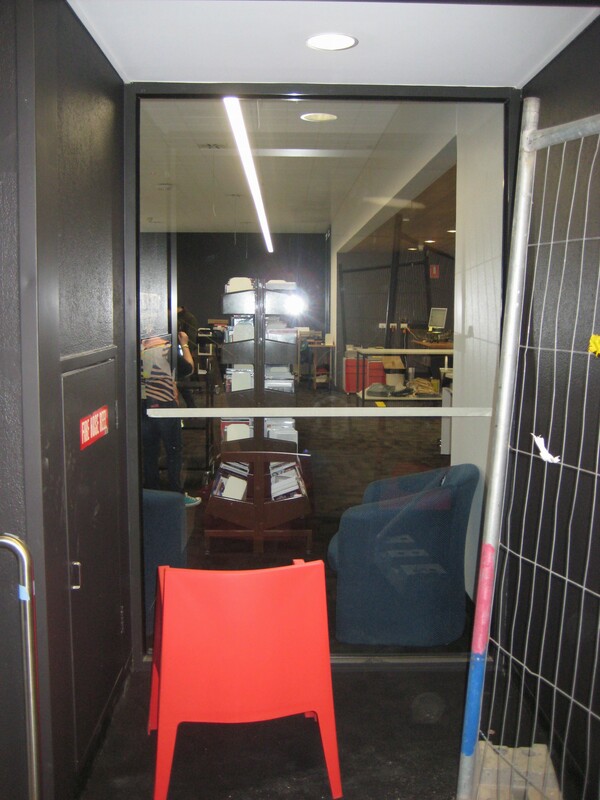 Tasmania’s Learning and Information Network Centres (LINCs) is not a traditional “library” in both name and services. As Garry explained, LINCs are in the competitive service industry, and have expanded beyond physical collections to offer a wide range of services for the community. An example of this at the Launceston LINC is the focus on literacy skills programs for children and adults. There are literacy coordinators and tutors that assist clients with various activities, such as reading to children and filling out forms. Workshops for job applicants will also be provided to support the community. In addition, LINC’s redevelopment will allow for several large meeting areas as well as after-hour access. Technical conveniences such as Wi-Fi, computers, and self-checkout stations will also be offered. 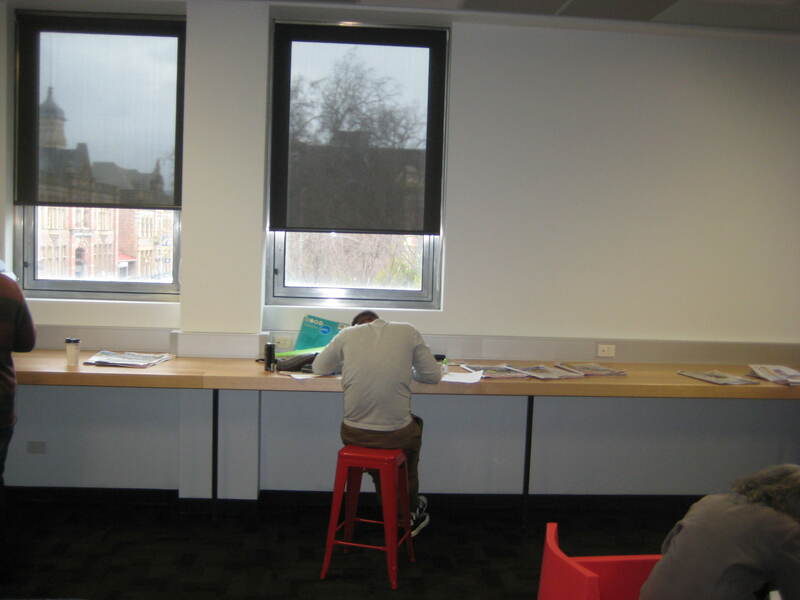 It was apparent that careful attention was given to the physical layout of the building design. Despite being the most popular public space in the area, they have a modest budget to work with that requires creativity. A vibrant atmosphere is provided with an on-site café and light wells stream into the building. There is an emphasis of employing open space that allows clients to work or relax, independently or collaboratively in a pleasant setting. Several bar tables with power outlets look out on the historic civic square. Staff’s role in the redeveloped LINC will be more proactive, as traditional service points have been reduced that will lead to roving interactions. In addition, dynamic art gallery systems and historical collections will be showcased. Children’s collections have expanded, and there is a breastfeeding room to accommodate this. 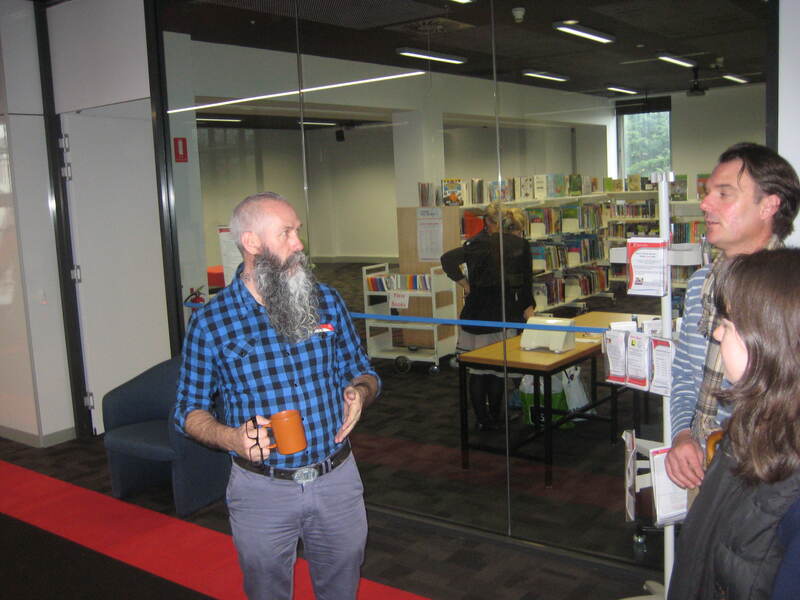 The few and far between members of the Tasmanian New Students and New Graduates group took advantage of this excellent opportunity to see first-hand how libraries are taking aggressive steps to maintain an important community presence. Thank you to Garry Conroy-Cooper for spending time with us and showing us the redeveloped Launceston LINC. Library jobs are far and few between in Tasmania. How can you transfer your library qualifications and skills into other employment sectors? Do you need help in preparing your resumes? How about answering those elusive selection criteria questions? The ALIA New Grads Group (Tas) is proud to present two guest speakers from Tasmania’s leading HR company – Searson Buck. We are fortunate to have their experienced career transition specialists Simone Ashby & Emma Ring to discuss career opportunities in the current job market and how you can transfer your array of skills to gain that perfect job! Market Ready is designed to give people the tools they need to get ready to enter the employment market, either for the first time or re-entering. 1. Ensure that your resume is clearly laid out, up-to-date and free of spelling and grammatical errors. I will then notify you of your designated reviewer who will contact you and will provide you with valuable feedback. Good luck and get working on those resumes! Please note: Depending on the numbers, this service will cease after July, so please make sure you get your resume in quickly for that new or next job! Want to see a top school library and more?! Well here’s you chance to visit one of the best school libraries in Tasmania. Your visit will also include a guided tour of the Hutchins Archives & Heritage Collection (Museum & Archives). There will be a chance to network and socialise after the tour at the Wrest Point Casino (3 minute drive from the school). Looking forward to seeing you there and then!